CH-90 Bevel Cluster 13.875 x 48.25"
Jerry called me about building a transom for he & his wife Renae for their home in Frederick, Maryland. They found a transom labeled "Clear Beveled Transom" on my website and wanted to build a similar piece. Jerry wanted 2 lightly colored outside bands with colors that would compliment their existing flower wallpaper (right). We discussed a number of possibilities for colors but Jerry made it too easy for me.... he stopped by a local stained glass supplier and gave me the stock numbers for both colors they wanted. Luckily both were Spectrum waterglass colors that I keep in stock. We decided the background should be clear waterglass that would have a shimmering effect ...... while the bevels sparkled. Thinking there was little chance of finding this beautiful and complicated bevel cluster, I searched the net and contacted several suppliers. Luckily, Ken at Harmony Glass found the same exact bevel cluster and agreed to order it for me. Above is the opening for the new transom. 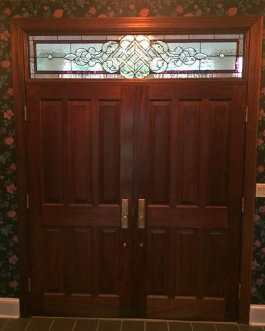 Jerry & Renae wanted a transom that would let in as much light as possible. With this 75 piece exquisite bevel cluster in an outside window, we expected the result to be quite dramatic. Jerry installed Renae's Transom as soon as it arrived. 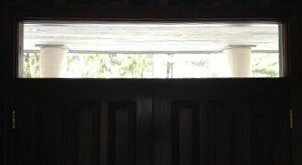 He sent me the photos below showing their new transom after installation. Obviously their color choices were perfect! What a great installation job.... looks like their transom was built with the house! 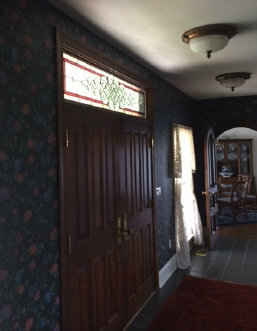 Renae's Transom was completed in June of 2014, measures approximately 14.5"x 71", and contains 143 pieces of glass including the 75 piece central bevel set. It now welcomes the daylight in its new home in Frederick, Maryland. 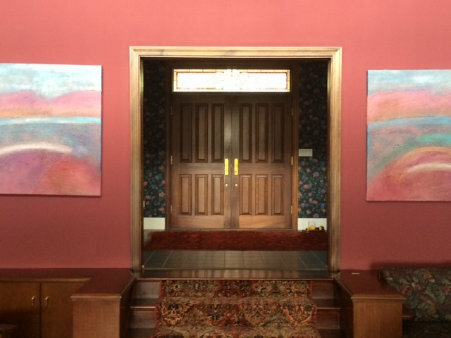 Renae's Transom - What magnificent color choices!